Lee Selby will take on Joel Brunker at the O2 Arena on 11 October in a final eliminator to face IBF featherweight champion Evgeny Gradovich. 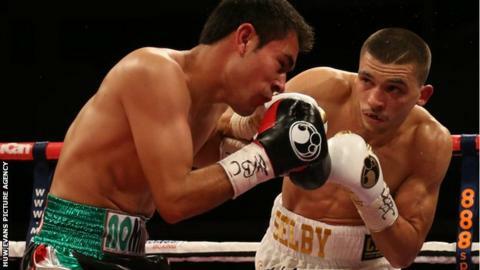 Welshman Selby, 27, has vacated his European featherweight title to clear the way for a shot at a world title. A points victory over Romulo Koasicha in May moved Selby closer to a shot at WBC champion Jhonny Gonzalez, but the IBF belt now seems a clearer path. "It's a huge night for Lee Selby," said boxing promoter Eddie Hearn. "It's one that will show that he is ready for a world title shot. "Brunker is a tough and talented Aussie with plenty of ambition, but I believe that Lee has timed his run to the top perfectly and will do the business on 11 October." Top of the bill in London will be heavyweight Anthony Joshua, the London 2012 Olympics gold medallist, as he fights for his first title. Joshua, 24, will take on Denis Bakhtov for the vacant WBC international title. Selby's decision to vacate his European title will see unbeaten Leeds featherweight Josh Warrington fight Italian Davide Dieli for the belt at the First Direct Arena in his home city on 4 October.